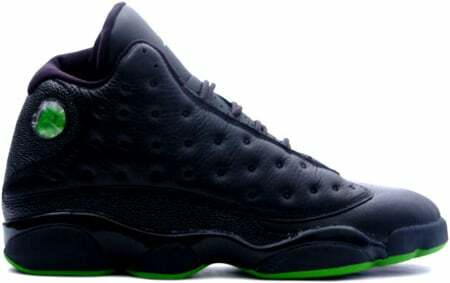 The Air Jordan 13 (XIII) Retro Altitudes was the first of its kind, containing a dominate upper Black, with a Altitude Green sole. Many sneaker heads dubbed the Air Jordan Retro 13 Altitudes the Black Cats (although the Air Jordan XIII is inspired by one). Hitting shelfs at Urban Accounts, the Air Jordan XIII (13) Retro Altitudes was a limited release and people lined up over night to get this pair. Now prices for the Air Jordan Retro 13 Altitudes can go for between $250 – $300.